Reasoning - Series Completion Questions and Answers. 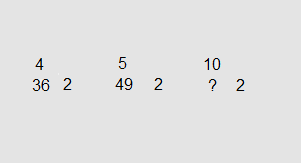 A series is given, with one number/letter missing. Choose the correct alternative from the given ones that will complete the series? 3. 0, 7, 26, 63, ? Answer - (a) 124. The pattern is 13 - 1, 23 - 1, 33 - 1, 43 - 1,53 - 1. 4. Y, U, Q, M, I, ? Answer - (d) E. The sequence is -4 for each step. Answer - (b) 31. The pattern is 3 x 2 + 1 = 7, 7 x 2 + 1 = 15, 15 x 2 + 1 = 31, 31 x 2 + 1 = 63, 63 x 2 + 1 = 127. Answer - (a) 3. The sequence in the given series is +3, +5, +7, +9. Answer - (d) 33. The sequence in the given series is +6, +9, +12, +15. Answer - (a) 19. The sequence in the given series is +4, +2, +4, +2, +4, +2. 9. 2, 8, 14, 24, 34, 48, ? Answer - (b) 62. 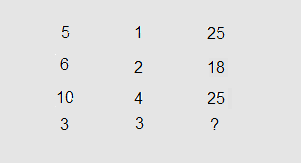 The sequence in the given series is +6, +6, +10, +10, +14, +14. Answer - (c) 101. 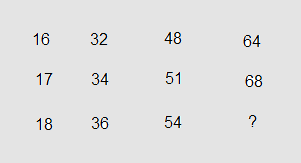 The sequence in the given series is +12, +20, +28, +36, +44. 11. 6, 14, 30, ? Answer - (c) 54. The sequence in the given series is +8, +16, +24. Hence, 30 + 24 = 54. Answer - (c) 144. The sequence in the given series is (4+2)2 = 36, (5+2)2 = 49, hence, (10+2)2 = 144. Answer - (d) 72. Each number in the first series moves by +16, Each number in the second series moves by +17, Each number in the third series moves by +18. Answer - (b) 6755. The sequence of the series is + 2218, + 2226, + 2234. Answer - (b) 45. The sequence of the series is + 9, + 8, + 7, + 6, + 5, + 4. Answer - (a) 3. 52 ÷ 1 = 25, 62 ÷ 2 = 18, 102 ÷ 4 = 25. Hence, 32 ÷ 3 = 3. Answer - (d) QO. The sequence is Y - 4 = U, U - 4 = Q, Q - 4 = M, similarly, X - 4 = S, S - 4 = O, O - 4 = K.
18. 198, 194, 185, 169, ? Answer - (c) 144. The sequence is 198 - (2)2 = 194, 194 - (3)2 = 185, 185 - (4)2 = 169, 169 - (5)2 = 144. 19. DKM, FJP, HIS, JHV, ? M + 3 = P, P + 3 = S, S + 3 = V, V + 3 = Y. 20. 1, 1, 4, 8, 9, 27, ? Answer - (b) 16. The sequence is (1)2, (1)3, (2)2, (2)3, (3)2, (3)3, thus, the next term would be (4)2 = 16. 21. 1, 4, 16, 64, ? Answer - (b) 256. The sequence is (1)2 = 1, (2)2 = 4, (4)2 = 16, (8)2 = 64, (16)2 = 256.